Ann Coulter claims she “killed.” Others say she “bombed.” What’s the truth? Ann Coulter upstaged Rob Lowe at his own roast, without even trying. But is there something more substantive to learn amidst all the folderol surrounding the Roast of Coulter with Lowe? Roasts depend upon humor and, in this case, the jokes targeting Coulter and those given by Coulter conceal and reveal Coulter’s heart. Moreover, Coulter arrogantly entered a forum foreign to her, believing that she would inevitably prevail. She was clearly unprepared for what she was about to experience. The Coulter with Lowe Roast was an equal opportunity roasting, with everyone getting singed, but Coulter was uniquely burned. The very best jokes contain at least a kernel of truth. Many of the jokes were actually accurate, on target. 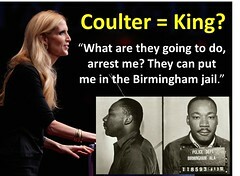 Coulter is known to be an offensive person because she purposely provokes offense. Coulter was clearly distressed and, in the beginning, visibly enraged. Toward the latter half of the show she was able to smile – a plastic, frozen smile to hide the incensed inferno within. 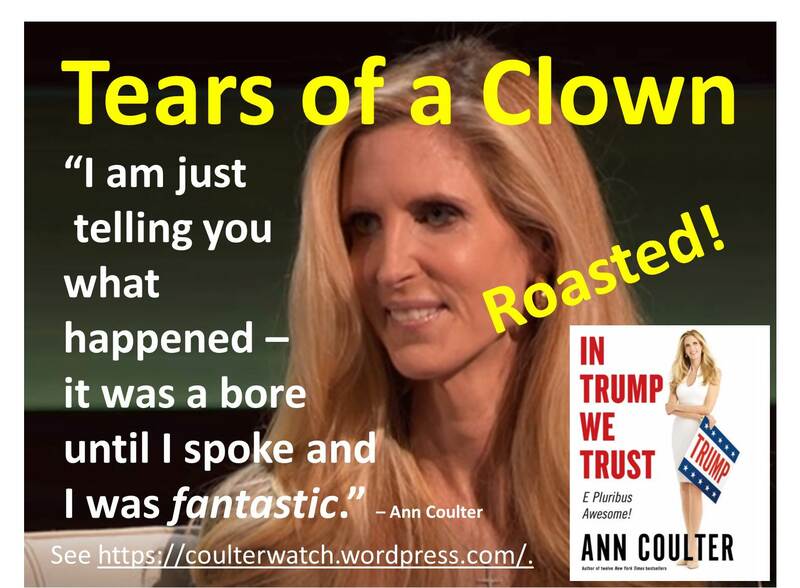 Claiming to have been “bored” by the whole roast, Coulter asserts, “I don’t notice ‘mean,’ but I do notice ‘jokes’ and I didn’t hear many of those – until I took the mic!” Boastful bravado masks her sorrow. But Coulter does care. Ann hates criticism more than most people and she recoils against ridicule (though she is quite quick to dispense it). 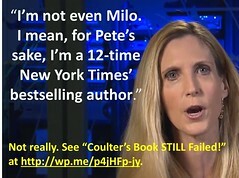 Coulter is a shameless person who hates to be shamed. The smallest criticism generates internal angst. Coulter’s rage was obvious in her own description of the event: “Hunt, hunt, hunt, Hitler, KKK, hunt, hussy, hussy, Hitler, KKK, burning crosses, hunt, she hates Muslims, hunt, hunt, hussy, hussy, hussy – now I have summarized the entire two hours I had to listen to.” She made similar characterizations on other programs. In our examination of this controversy (one which Coulter has, once again, ably exploited), a crucial element in this saga must be cleared up. The consensus on the Internet and social media is that Coulter bombed. This is nonsense. The audience disliked Coulter’s politics (and tasteful) humor. As for Coulter’s actual shtick, it would have served her well to revise her prepared remarks after experiencing what a roast is really like. Instead, politics suffused her routine. One-liners are standard fare for a Coulter speech, but this wasn’t supposed to be a speech – it was a roast. That reminded of an MRC Dishonors Awards ceremony where Coulter had been slated to introduce Rush Limbaugh, who abruptly canceled his appearance. Rather than introduce the actual speaker, Coulter introduced him as if he were Limbaugh so that her prepared material would not go to waste.